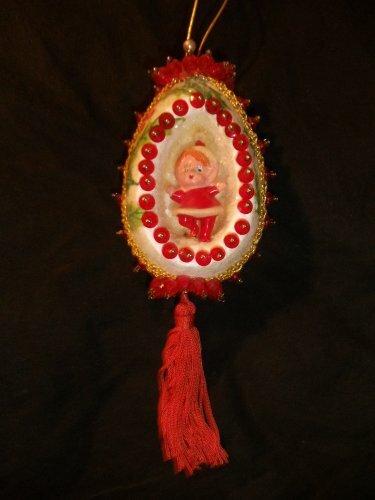 My grandmother "Mary" sat me down and showed me at the age of 11 that even though I could not afford the expensive catalog ornament I was looking at didn't mean I couldn't create one like it by what we had around the house and a few store bought items. I hang this ornament every year and smile and remember how even though she is no longer with us she has passed on the skill of crafting and savings to me and I will do the same with my daughter. Depending on the napkin design you pick and figure to display is how you choose the colors of the beads and ribbons you would like. This ornament is special because it reflects your taste and will coordinate with your home since you get to personally design it. Take Styrofoam egg and a spoon and scrape out a cave like opening to display your figure in... set aside. 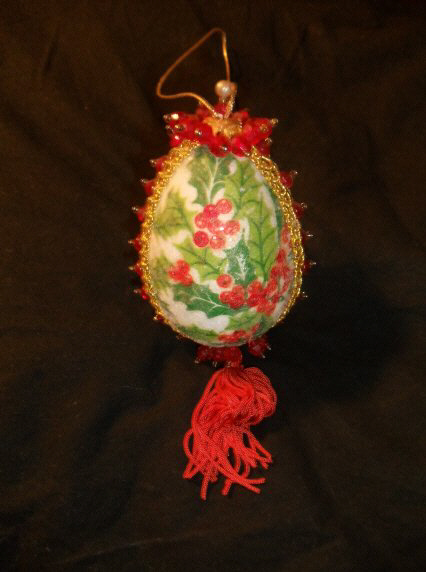 Cut out from the napkins the floral or design you would like to place on your egg. Check it up against your egg to see where it fits nice. Make sure you peel the napkin down to only one ply after cutting it all out and place carefully in the arrangement you would like it on the outer side of the egg, covering all the way to the edges. Set cut out design aside. Coat the entire outside of the egg with a 2 part glue and 1 part water mixture with a paint brush, then place your napkin cut outs on the gluey egg. Very important to keep in mind, once you place them to the glue you will not be able to move them. Let it dry completely. Re-coat the egg in glue mixture once more over, coating the cut outs and inside the egg this time. Sprinkle with pixie dust glitter to get the snowy glittery effect. Now let second coat dry completely. Stick in place or glue in place the figure inside the egg. Take a small bead and place it on the stick pin, then a large bead, then stick the beaded pins in the Styrofoam framing the edge of the cave and displayed figure. Take your ribbon and place long ways down the side of your egg starting at the bottom of the egg and working your way around it. Pin it in place by neatly pushing the decorated beaded pins into the middle of the ribbon even spaced. Next take the small tassel (tassel is optional) and thread it through the center of the floral filigree, and tie a knot off so it won't slip through. 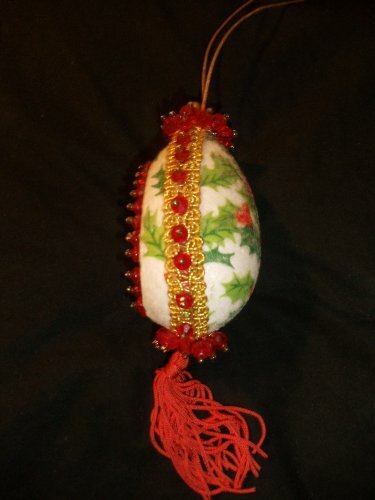 Take the tasseled filigree and place it on the bottom of the egg so you cannot see the unfinished ends of the overlapping ribbon. Insert decorated beaded pins into the end holes of the filigree and into the egg to keep in place. At the top of the egg place the filigree and insert the decorated beaded pins the same way to keep it in place. To create the loop to hang the ornament do the same way as the tassel but finish it by taking the hat pin or head pin and place a small bead than one large bead on it, than stick it through the center of the filigree and the center of the cording. You are now done and it's ready to hang! I would like to add that this was a lesson on saving money on top of being crafty and using what you have. I was 11 and we could not afford the ornament kit that was priced $12 for just one back in 1986. But my grandmother Mary showed me that there was a way to save money and still have something just like it by using many of the items we had around the house. The only thing we had to purchase was the egg and glitter. From that day on I have made and created many items and stayed on budget because of her and her love to teach me the way. She has past away from a long battle with cancer in 1994 but her ornament that she helped me create still hangs on our tree and makes me smile as she lives on through it! Copyright © 2010 by Kimberly Labno-Clark. All rights reserved.